LUDLOW — Ludlow Elementary School science teacher Lisa Marks returned home from Washington, D.C., last week as one of four Vermont teachers to have received an award for excellence in teaching from President Obama. The Presidential Award for Excellence in Mathematics and Science Teaching is the nation’s highest honor for American math and science teachers for grades K-12. Marks said principal Karen Tromboli nominated her. Marks said the process entailed videotaping her class and answering a number of questions: how the teachers relate to their students, and how they prepare the students for the next generation of science standards. “A lot of it concerns critical thinking, teaching philosophy, how I gauge the students,” she said. “That goes to a panel for the state, and they pick the finalists. The finalists get to go to Washington to face another panel,” this one selected by the National Science Foundation. From there, the waiting begins. Winnowing the candidates takes time, including President Barack Obama reading through some of the submissions. Marks said she learned she was a state finalist last July, and in October, the FBI wanted to do a background check. During the four-day trip to Washington, the teachers got to meet such dignitaries as the secretaries of Energy and Education, as well as visiting the museums. There was only one thing missing at the Sept. 8 ceremony: President Obama. According to the state Department of Education, a total of 213 educators were awarded from all 50 states. Besides Marks, the other Vermont winners were Laura Botte-Fretz, a mathematics teacher at Edmunds Middle School in Burlington, also in the elementary division; Katherine McCann, a mathematics teacher at U-32 Middle High School; and Mary Louise McLaughlin, a science teacher at Barre Town Middle and Elementary School. 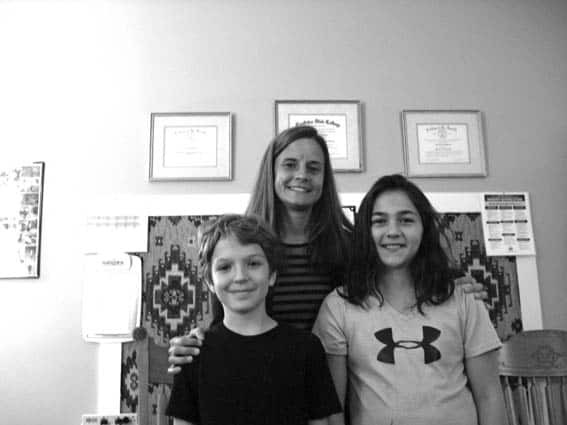 Lisa Marks (center) with two of her students, Josh Buckley (left) and Riley Paul (right).